One of my New Year’s Resolutions is to eat a simple, tasty and healthy breakfast on the days I go to work at 6:30 in the morning! It has to be pre-made and be capable of reheating. I thought about a frittata. After doing some research, I came up with this combination of ingredients. 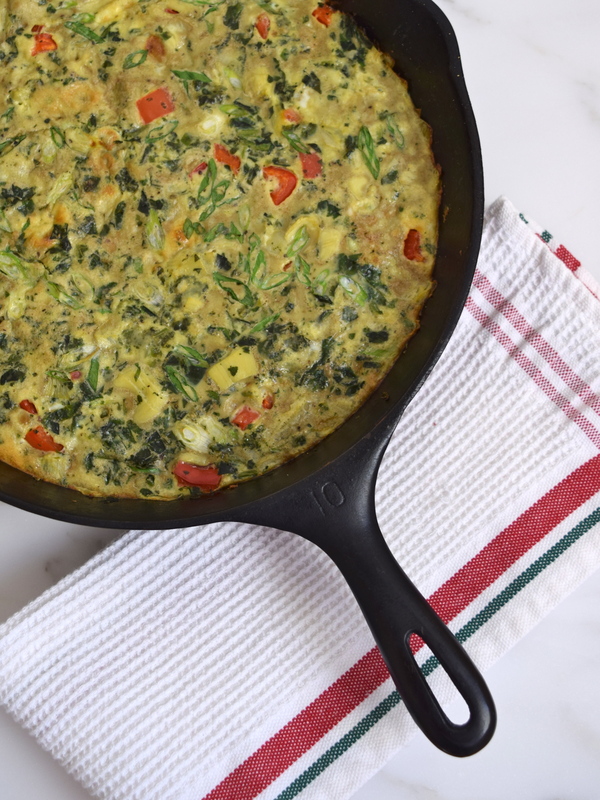 I had never made a frittata before, so I was somewhat surprised how easy it is to make. It is also quite versatile, you can choose different vegetables, cheeses and meats, whatever you like! Just make sure you have enough egg to cover the ingredients. It looks like we will be having delicious and healthy frittatas on a regular basis on Sunday mornings, so I will have leftovers for the work week! In a medium bowl, whisk eggs and milk together. Add salt and pepper to taste. Heat oil in a 10-inch cast iron skillet over low to medium heat. 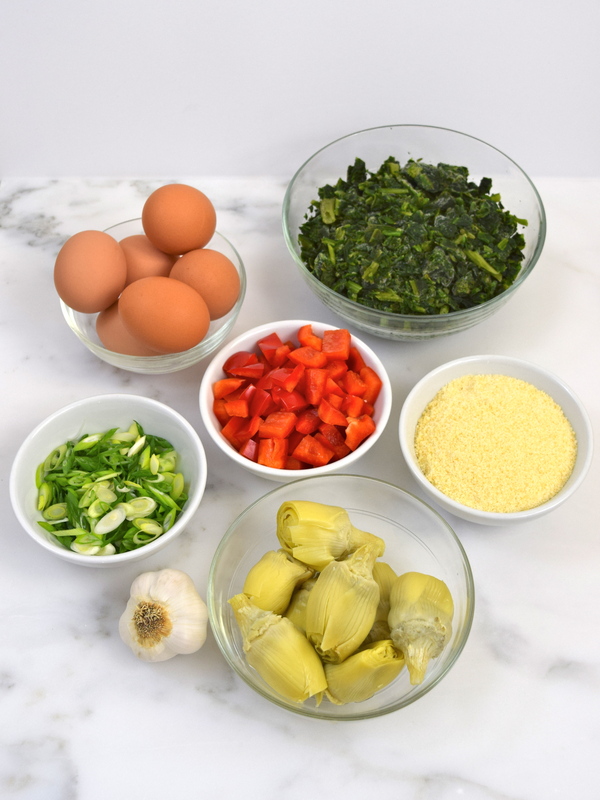 Add garlic, artichoke, spinach, green onion and red bell pepper. Cook for about 5 minutes. Add Parmesan cheese and stir. Add eggs. Cook for a few minutes, until you see eggs start to set on the edges. Place skillet in oven for about 10 minutes, until lightly brown and toothpick comes out clean in the center. Serve immediately. Serves 6. 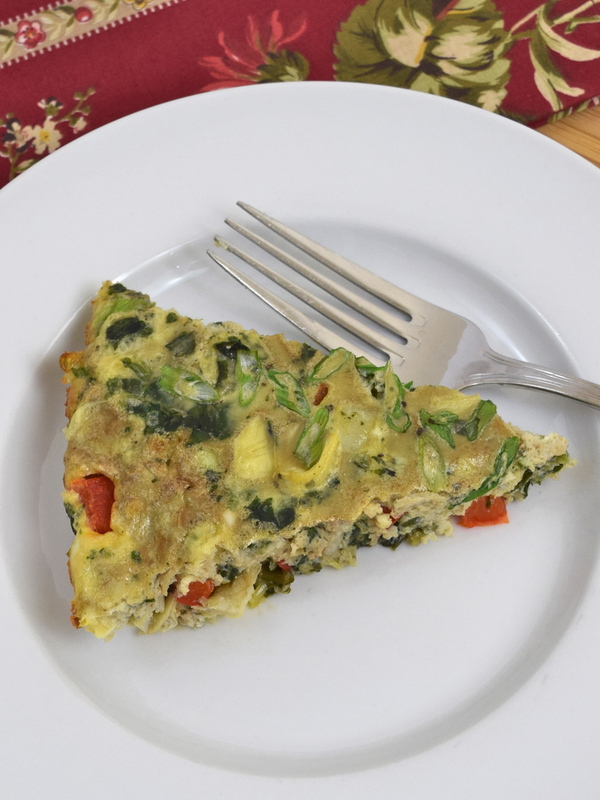 If you can make scramble eggs, you can make a frittata. The cast iron skillet makes it so easy….from cooktop to oven. Thank you and good luck! Hi Rena and welcome to Fiesta Friday this week. We hope you continue to join us. Thank you for bringing one of the most ingeniously convenient and easy (and also delicious) breakfast (or lunch or dinner!) dishes, the frittata, to the party. And especially for including artichoke hearts, they are so meaty and tangy and delicious! Have a fabulous weekend!! Thank you! Love the way you express yourself!